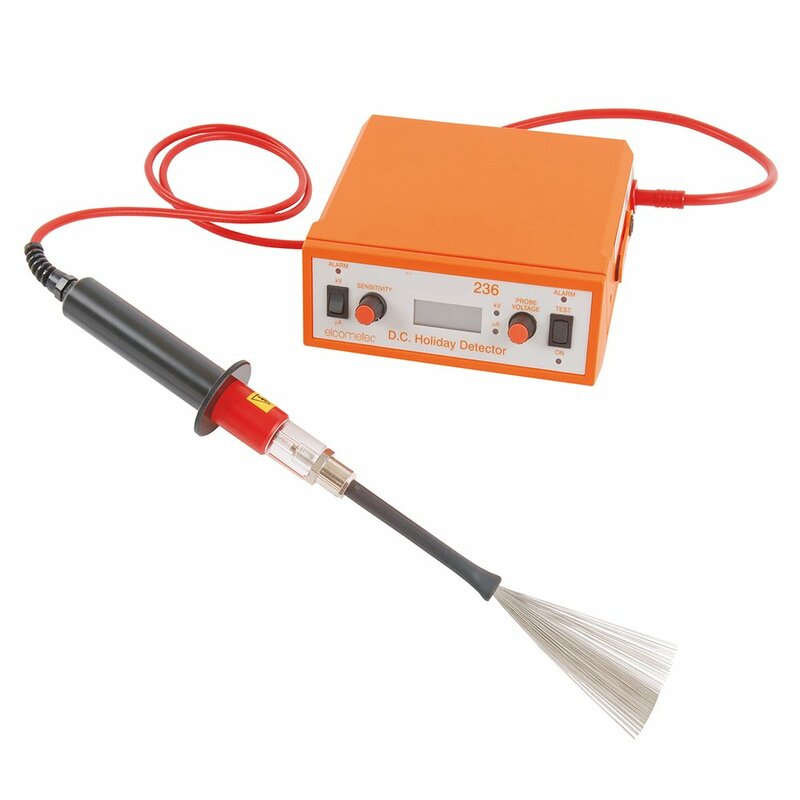 This instrument performs high voltage testing to detect pits, holes, flaws etc in coatings. The ELC2100B-236V2's convenient carrying case allows the probe handle and accessories to be attached to the front making the ELC2100B-236V2 ideal for field, site or laboratory inspection. An accessory pouch, which accommodates the additional rechargeable battery (optional) can also be attached to the soft carrying case - thereby extending inspection time without the need for recharging the unit. The ELC2100B-236V2 is available in two versions: 1 - 15kV and 2 - 30kV. Each unit provides the User with complete control of voltage and sensitivity settings. Due to the method of operation, the ELC2100B-236V2 minimises the risk of additional damage to a coating and avoids the dangerous act of coating popping off the surface which can occur with some high voltage systems. The ELC2100B-236V2 DC Holiday Detector is supplied as a complete kit, allowing the User to begin testing immediately after charging the unit. The kit is supplied in a hard backed transit case for transportation and long term storage. The High Voltage Detection Technique locates flaws in insulating coatings on conductive substrates. A power supply within the instrument generates a high DC Voltage which is supplied to a suitable probe. An earth voltage return lead from the instrument is connected to an uncoated area of the metal of the test substrate. As the probe is passed over the coated surface, a flaw is indicated by a spark at the contact point with an audible alarm in the detector and a visual alarm in the probe handle. Note: This test uses the principle of an electric current conducting through a material. When a spark occurs, the circuit is closed and the alarm sounds indicating a flaw. Varying the DC Voltage varies the distance a spark will "jump" to the metal substrate. The maximum distance a spark will jump is dependant on the dialectric strength of free air. The High Voltage Technique can be used to locate flaws in coatings on concrete. As most concrete conducts electricity (due to moisure inherent in concrete), the ELC2100B-236V2 can be used.